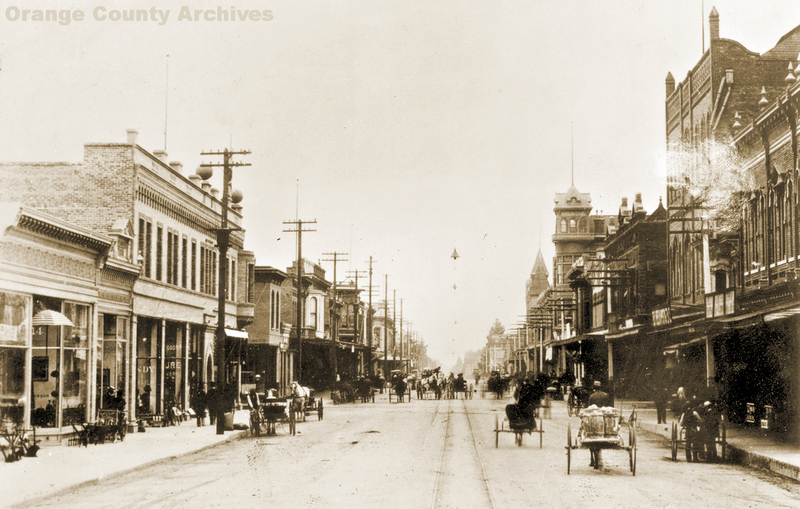 Fourth St., Santa Ana, circa 1887. "Santa Ana is certainly coming to the front. We are bound to be and will be something yet. We have already enough and to spare of some things. For instance, if you want a few preachers, or school teachers, we can supply you., and as for doctors we could supply the whole county. [Ed - Orange County was still part of Los Angeles County then.] We have all sorts: the old, the young, the half-breed Indian, the street corner loafer, the aristocrat, the little pill, the big pill, yes any kind of a pill. Every second man on the streets of Santa Ana is a doctor. 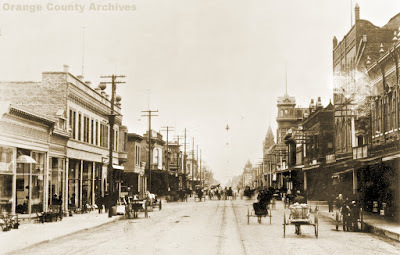 "...Mechanics of all kinds are very busy, [and] more could find employment if here, as there is much improvement going on and much more to be done both in town and country. "...Wild geese are very plentiful just now. Come down, some of you city sportsmen, and take a few. We don't want them all. A few less doctors, preachers and lawyers. A stop to building more churches at present. A much larger school house. A few good servant girls. A few more marriageable gentlemen. A few less street corner loafers. Actually, Fourth Street has changed a lot and continues to evolve. Yes, it has its share of shops stores selling off-brand beauty products, quinceanera dresses, unlicensed Disney toys, religious brickabrack, etc. That's a lot of its charm. But there are also some really good restaurants, both Wells Fargo and B of A banks, sort of an "art house" movie theater, and even the obligatory Starbucks. And the fascinating the history and architecture alone make this area a pretty interesting place to spend a Saturday. best way is to drive and park around 4th st then just walk up and down. The Fallas Paredes clothing store was the former Woolworth's as it says on the floor tiles. There is also a store that sells spray cans and markers for future "taggers" but it is "controlled" by the presence of the Santa Ana Constables. For those who remember, I imagine it's pretty easy to be nostalgic for a time when we didn't have "taggers" polluting and damaging public and private property. Personally, I can't figure out why anyone would want to screw up their own neighborhood (or anyone else's, for that matter).